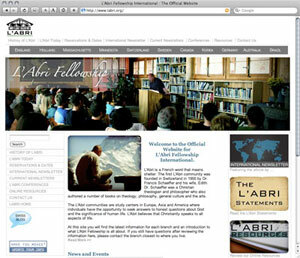 I'll be be adding more information about the web design services, but would first like to show you the recently updated L'Abri Fellowship International website. After going through 4 different models, and many pieces of paper, I created one that I think will help L’Abri Fellowship’s online presence through functionality, usability, design and ease of use. I have had to recreate every single page from code to graphic and have made a model that will be easily updated and easily refreshed. It’s about 100 pages and it was a fair amount of work. But now using CSS and some other technologies, I’ll be able to update the site with much more ease. Please have a look and enjoy the new site!! www.labri.org. Please feel free to contact us for any size project. ©2010 Michael Shivers + mdshivers Creative Media. No image on this website may be reproduced without the express and written permission of Michael Shivers.